5 bedrooms, 2 superb pools, 200sqm living & dining area! 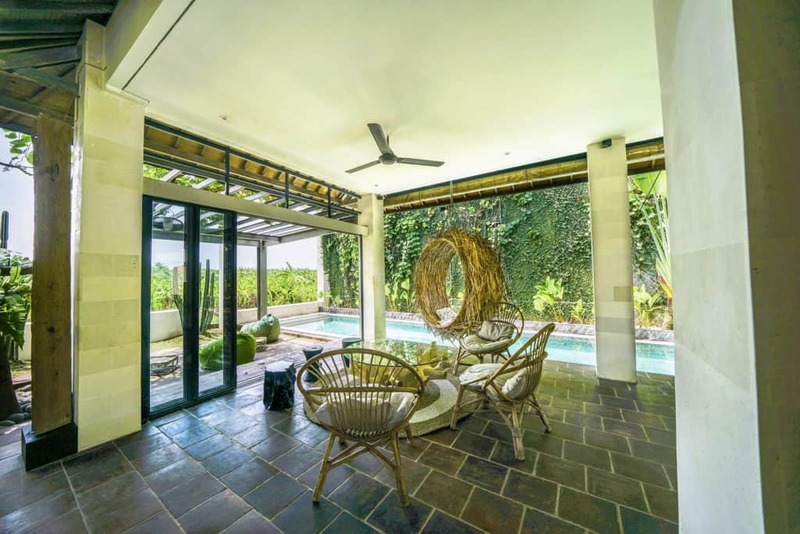 There is no place like Villa Nyoman in Seminyak, Bali! 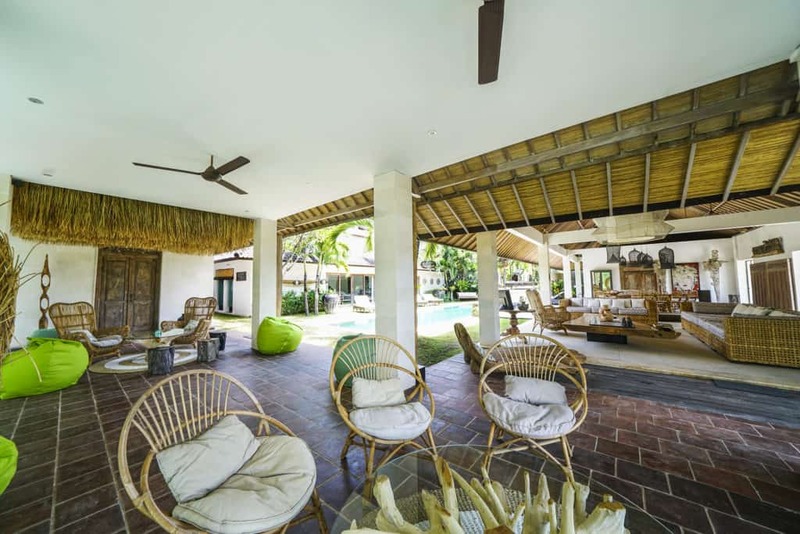 This amazing 5-bedroom villa amazes everyone with 2 huge private swimming pools, spectacular rice paddy views and a private event/yoga space. 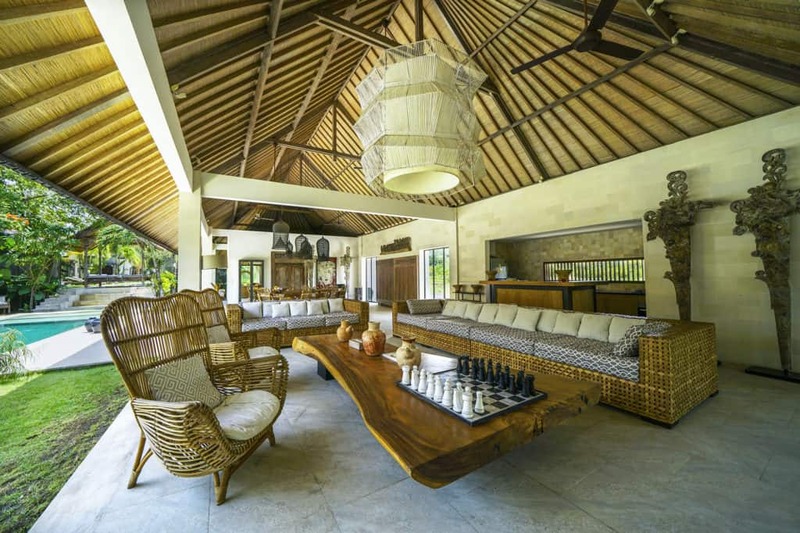 Villa Nyoman features a very large open-plan living room and 6 luxurious bedrooms. The 18-meter swimming pools have got shallow areas for in-water sunbathing and water fun with the kids. The large open living space features sophisticated antiques and a really impressive collection of tribal artwork as well as modern entertainment facilities. It is all about spaciousness and luxury at this villa – the perfect haven for all of your special events, celebrations and retreats! 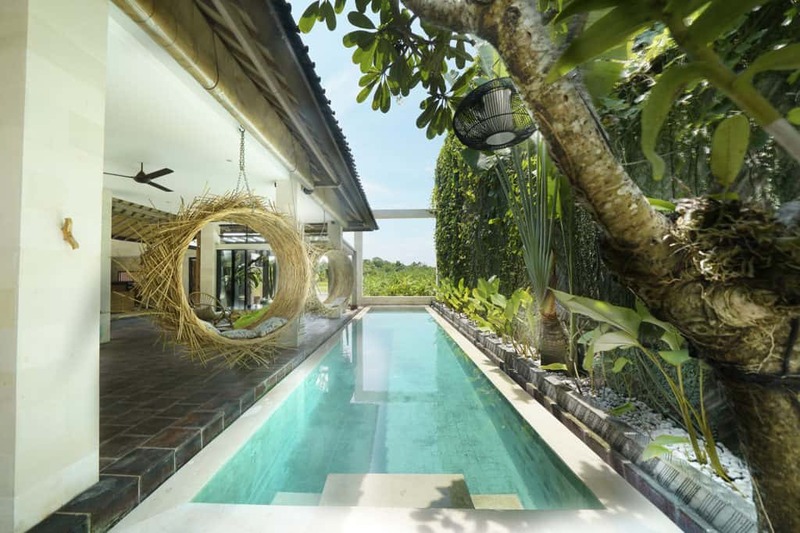 Having 2 massive private swimming pools in one large rice-paddy-view garden is quite something unique! Especially here in the buzzing town of Seminyak. Then, the private event space really tops it off! 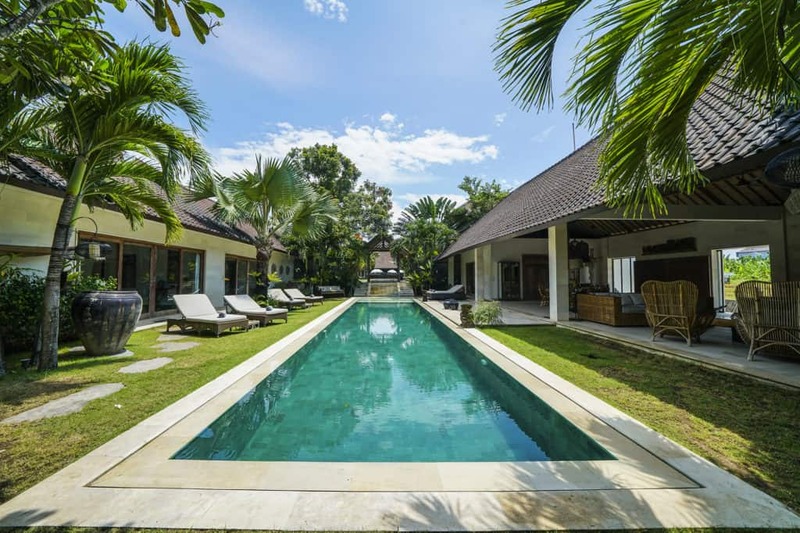 Villa Nyoman is a dream-come-true for families, groups and all of your villa events! Please note that some bedrooms have twin beds that can be setup as queen/king with a mattress top and appropriate linens. This can be very convenient for families with teens or groups. Contact us for more information! Please note that the rates above are per night, in USD and subject to a 15.5% surcharge for Tax & Service. For more information about rates (ie seasons, minimum stays, etc. ), please view our Rates & Conditions. Note: when renting 3 or 4 bedrooms, the villa remains fully private, we simply lock the access to the remaining bedroom(s). A great moment, an idyllic stay! I highly recommend this place, well located. The staff is very welcoming attentive while being discreet, available all the time. The bedding is perfect very clean. I stayed there two weeks with my children in villa Nyoman. We were delighted! Quickkk take me back to Abaca in Bali! I spend a week last autumn in the Nyoman villa (Abaca resort) it was a beautiful moment, perfect location, with quiet services and personnel. We get our private villa, super cute and frenchie decoration. I recommended 100% Abaca in seminyak, it’s my favorite place close to everything’s (shops, beaches, massages…) take me back!! Best and safe family place! Great location, really pleasant and clean rooms! The thing that makes Abaca Villas such a good place to stay is the staff. They all are incredibly helpful and generous with their time. We travelled with two six-year old and lots of luggage. Villa Nyoman was one of the nicest places we stayed in the four weeks we were in Bali. Amazing breakfasts, with rare gluten free products! Thank you, we will come back!